Open office plans: heaven or hell? A neo-impressionist and a social realist walk into a bar . . .
Now that we have your attention, are you wondering what the two artists have in common? 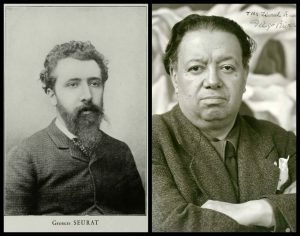 If you are thinking of Georges Seurat and Diego Rivera, the thing that links them together is the fact that both of them were born in December. But there may be other commonalities if we look a bit deeper. Georges Seurat was born on December 2, 1859 in Paris and many art history books gives him credit for being the innovator of Pointillism. However, according to the resource AskArt, “his methods were complicated enough that Pointillism is only partially descriptive of his accomplishments, and the more accurate description is ‘Founder of the 19th-century French school of Neo-Impressionism.’ Using this technique, he created huge compositions with tiny, detached strokes of pure colour too small to be distinguished when looking at the entire work but making his paintings shimmer with brilliance." Pointillism, in fact, does imply rounded dots and Seurat’s markings frequently deviated from that and were more irregular shapes, triangles and squares. Many art scholars define his style as Divisionism or Neo Impressionism, which shares a characteristic with Impressionism by advancing ways of painting directly from tubes of pain onto canvas. Divisionism sought to juxtapose bits of color, both in harmony with and in opposition to one another, to achieve a new luminosity. It also applies the science of optics and the chemistry of colors to create an overall effect. 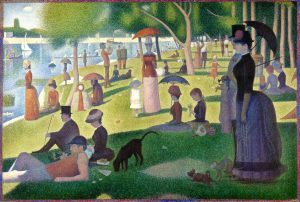 The first painting where Seurat fused design and color into composition was Sunday Afternoon on the Island of the Grande Jatte, (which may be seen at the Art Institute of Chicago). To execute this huge work, he not only did more than 20 preliminary drawings, but also had 38 sessions of painting. Seurat was not given admission to other Salons because of what was seen as his violation of traditional methods. So, he and other pioneering artists formed the Societe des Artistes Independants, featuring Sunday Afternoon on the Island of the Grande Jatte at their 1886 exhibition. Seurat’s work ethic was intense. An anonymous observer in 1890 wrote “He works . . . like a laborer, from 9 o’clock in the morning until 7 o’clock at night . . . “ His attention to detail, with the placement of the color points, meant that the human eye would mix all of these small bits of colors to form the image he had composed. However, for all of this effort, it can be noted that the people in his paintings are, for the most part, rather stiff. They are balanced and designed, inhabiting space but in a somewhat airless fashion. Compared to Seurat, the works of Diego Rivera seem completely at odds. However, we can find a few common threads. Born on December 13, 1886 in Mexico, Rivera studied art starting at the age of 11 and continued to paint for many years in Europe. When he met his first common-law wife in Paris, he learned about Marxism, Cubism and Picasso. Returning to Mexico in 1922, he joined forces with two other revolutionaries, Orozco and Siqueiros and formed a government-backed syndicate of artists who moved from easel painting to working on murals. Over the next ten years, Rivera would do what were some of his greatest work, frescoes in Chapingo and Cuernavaca. Over his lifetime, Rivera visited Moscow, married Frida Kahlo (and then married again not long after her death), and became known for his works which showed that he was a master of space and light and figure composition. He also became known for his murals in which he openly expressed his opinions on controversial subjects, including Communism. The most notorious of this was his large mural in Rockefeller Center which included a depiction of Lenin uniting the workers. The Rockefeller family had initially approved of the mural which showed the aspects of contemporary scientific and social culture. However, when Rivera included the image of Lenin, which he refused to remove, Nelson Rockefeller ordered the mural to be plastered over before it was completed. While Rivera painted dozens of society portraits, typical Mexican scenes and nudes, most people associate him with his large murals (similarly to how the name George Seurat evokes the large painting, Sunday Afternoon on the Island of the Grande Jatte), as well as his style which featured rich colors, simplified lines and large figures. Also like Seurat, Rivera had a fierce independent streak. He is considered by many to be the greatest Mexican painter of the 20th century and is credited for reintroducing fresco painting into modern art and architecture, stimulating the entire Mexican muralist movement.